Your Traxxas XO-1 Supercar deserves the best in performance accessories. This complete kit includes everything you need! We have taken all the guess work out of getting extreme perfomance. This kit includes the best charger on the market, giving you the ability to balance charge your stock packs in as little as 15 minutes. Most chargers on the market are limited to 50 watts and would require a charge time of 90 minutes. We also include the most powerful RC power supply available, the 12v 750W MaxAmps Power Supply. High quality chargers require high quality power sources for maximum performance. Optional 24v 1500W MaxAmps Power Supply delivers the fastest charge times possible. Also included is an authentic "Lipo Sack". These are made in the USA and are the highest quality storage and charging bag available. 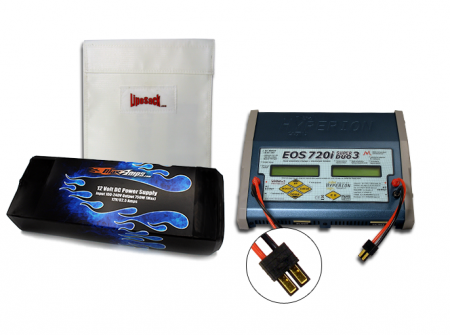 *For the ulitmate punch and highest top speeds, your X0-1 requires MaxAmps.com LiPo batteries. Year after year, MaxAmps.com batteries are ranked number one in the industry by multiple magazines and industry organizations. They offer the best performance and reliability for your new X0-1 Supercar. These packs are assembled here in the USA and are built to order using factory fresh cells. They are rated at 120c to 150c vs the stock 25c packs. MaxAmps.com packs are also waterproof and come with a lifetime warranty. With this kit, you have the opportunity to upgrade to the highest quality packs at a reduced price using the drop down menu below.